Two field trips were made during 2017 to Cayo Arenas and Cayo Arcas, southern Gulf of Mexico. Direct and indirect sampling methods focused on shell-less marine heterobranchs were carried out. As a result, 30 species of sea slugs are reported for the first time from these 2 remote reefs off the Yucatán Peninsula. From these, 7 species hold new distribution records for the Gulf of Mexico: Sclerodoris worki, Platydoris angustipes, Polycera odhneri, Hexabranchus morsomus, Limenandra nodosa, Petalifera ramosa, and Hermaea cruciata. Hexabranchus morsomus is a considerable west geographical range extension from the known distribution range, so far restricted to the Caribbean Sea. Nine specimens were identified up to genus level: Cuthona sp., Haminoea sp., Petalifera sp. and Elysia sp. With the present contribution, the sea slug richness in the Campeche Bank increases to 94 species. En el 2017 se llevaron a cabo 2 muestreos en los arrecifes de Cayo Arcas y Cayo Arenas, al sureste del golfo de México. Se realizaron muestreos directos e indirectos enfocados en la búsqueda de moluscos heterobranquios sin concha. Como resultado, se registraron por primera vez 30 babosas marinas para estos 2 arrecifes lejanos a la península de Yucatán. De éstas, 7 especies son nuevos registros para el golfo de México: Sclerodoris worki, Platydoris angustipes, Polycera odhneri, Hexabranchus morsomus, Limenandra nodosa, Petalifera ramosa y Hermaea cruciata. Hexabranchus morsomus presenta una ampliación geográfica importante, ya que su distribución estaba restringida al mar Caribe. Nueve ejemplares fueron identificados a nivel de género: Cuthona sp., Haminoea sp., Petalifera sp. y Elysia sp. Con la presente contribución, la riqueza de babosas marinas para el Banco de Campeche se incrementa a 94 especies. The southern Gulf of Mexico has been recognized for its economic importance due to oil and gas, fisheries, and sea-transportation activities. These activities may pose serious threats to the local habitats and their species, especially to coral reefs. Specifically, the Campeche Bank is comprised of several remote coral reefs, Alacranes reef is the largest, best studied and the only marine protected area, followed by smaller reefs such as Triángulos, Cayo Arcas, and Cayo Arenas, with emerged sand and coral-rubble cays, relatively sheltered lagoons and areas that maintain semi-permanent human habitation such as lighthouse keepers or military posts, as well as Banco Nuevo, Banco Inglés, Banco Pera, and Obispos, which are submerged reefs (Tunnell et al., 2010). Cayo Arcas reef is located 167 km offshore from Puerto Progreso and includes 3 sand cays: Central, East and West (Fig. 1; Table 1), just at the border of the PEMEX oil fields exploitation restricted area (Tunnell et al., 2010). Cayo Arenas reef is 128 km offshore from Campeche and has 3 emerged cays: Northeast, West and Southeast (Fig. 1; Table 1). Since 2008, several studies have attempted to update the species inventory in the southern Gulf of Mexico reef with a special focus on cryptic and less charismatic taxa. This inventory is steadily increasing the knowledge of the region’s species diversity of several groups such as fishes (Moreno-Mendoza et al., 2011; Robertson et al., 2016; Zarco-Perelló et al., 2014), crustaceans (Duarte et al., 2014; Escobar-Briones & Jiménez-Guadarrama et al., 2010; Paz-Ríos & Ardisson, 2013; Paz-Ríos et al., 2013a, b, 2018a, 2018b; Santana-Moreno et al., 2013), echinoderms (Hernández-Díaz et al., 2013; Solís-Marín et al., 2015), cnidarians (González-Muñoz et al., 2013; Mendoza-Becerril et al., 2018), sponges (Ugalde et al., 2015) and mollusks (Ortigosa et al., 2013, 2015, 2018; Reyes-Gómez et al., 2017; Sanvicente-Añorve et al., 2012). Figure 1. Cayo Arcas and Cayo Arenas, southern Gulf of Mexico. Main characteristics of the 2 emerged platform reefs Cayo Arcas and Cayo Arenas, Campeche Bank (based on Tunnell et al., 2010). Shell mollusks are relatively well described for this region (García-Cubas et al., 1999; González et al., 1991; Hicks et al., 2001; Kornicker et al., 1959; Rice & Kornicker, 1962; Vokes & Vokes, 1983). However, specific groups such as nudibranchs and other shell-less mollusks known as heterobranchs or marine sea slugs were poorly represented in previous literature due to the lack of specific collecting methods. Recently published information comprises 84 sea slug species from 4 Campeche Bank reef localities: Alacranes (Ortigosa et al., 2015; Sanvicente-Añorve et al., 2012), Sisal, Madagascar, and Serpiente (Ortigosa et al., 2013). The main aim of the present work is to present the sea slug species inventory from Cayo Arcas and Cayo Arenas. Heterobranch specimens were collected at intertidal and subtidal areas from 19 different collecting sites (Table 2); 4 dives (281 minutes) were made during April-May 2017 at Cayo Arcas and 10 dives (1 nocturnal, 688 minutes) in June 2017 at Cayo Arenas. Sites ranged from 5.3 to 7.7 m depth at Cayo Arcas and 6.8 to 22 m at Cayo Arenas. Specimens were obtained using direct manual collecting on suitable habitats, as well as extraction of potential substrate such as algae and sponge (indirect method) (Caballer-Gutiérrez et al., 2015; Camacho-García et al., 2014; Goodheart et al., 2016). Collected substrate was split onto white trays with fresh seawater and examined after 4-6 hours looking for animals that ascend to the water surface or to the walls of the trays. Collected specimens were photographed and sedated with MgCl2 solution, then preserved in 96% alcohol and deposited at the “Colección de Moluscos de la Península de Yucatán” (CMPY), Unidad Multidisciplinaria de Docencia e Investigación Sisal (UMDI-Sisal). Taxonomic nomenclature and systematics followed Bouchet et al. (2017) and MolluscaBase (2018). For certain species the buccal mass was dissected, and the radula and jaws were observed. Distribution range of widespread species is only allotted to the western Atlantic region. Countries are listed in alphabetical order. Previous records from the Gulf of Mexico (GM) and Caribbean Sea (CAR) in Mexico are specified. Sampling sites at Cayo Arcas and Cayo Arenas, west Campeche Bank, Gulf of Mexico. Inventory of the sea slugs fauna from Cayo Arcas and Cayo Arenas reefs, west Campeche Bank, Gulf of Mexico listed in alphabetical order. For sites information see Table 2. References: aHicks et al. (2001), bValdés et al. (2006), cSanvicente-Añorve et al. (2012), dOrtigosa et al. (2013). We found 87 specimens that were identified to 30 species, 11 at Cayo Arcas and 23 at Cayo Arenas, belonging to 19 genera and 17 families (Table 3). From these, 10 represent new species records for the region and from those, 1 is new for the GMx. For Cayo Arcas, the order Nudibranchia had the highest number of species (7 species), while Cephalaspidea, Aplysiida, Pleurobranchomorpha, and Sacoglossa had 1 species each. For Cayo Arenas, the Nudibrachia also had the highest number of species with 9, followed by Sacoglossa with 6, Aplysiida with 5, and Cephalaspidea with 3 species. Distribution: Aruba, Bahamas, Barbados, Bermuda, Bonaire, Brazil, Cayman Islands, Colombia, Costa Rica, Cuba, Curaçao, Guadeloupe, Jamaica, Mexico (GM), Panama, Puerto Rico, St. Martin, St. Thomas, USA, Venezuela, Virgin Islands (Alvim & Dias-Pimenta, 2016; Caballer-Gutiérrez et al., 2015). Distribution: Bahamas, Barbados, Costa Rica, Jamaica, Mexico (new record: GM), USA (Camacho et al., 2014; Valdés et al., 2006). Material: ARC0B, 1 specimen, 50 mm. Material: ARE09, 1 specimen, 2 mm (CMPY-000633); ARE28, 1 specimen, 3 mm (CMPY-000642). Distribution: Aruba, Bahamas, Barbados, Bermuda, Bonaire, Brazil, Cuba, Curaçao, Guadeloupe, Mexico (new record: GM), USA, Venezuela (Caballer-Gutiérrez et al., 2015; Valdés et al., 2006). Material: ARE01, 4 specimens, 4-12 mm (CMPY-000620; CMPY-000621; CMPY-000630; CMPY-000631). Distribution: Bahamas, Cuba, Martinique, Mexico (GM), USA (Ortigosa et al., 2015; Valdés et al., 2006). Distribution: Bahamas, Barbados, Costa Rica, Cuba, Guadeloupe, Jamaica, Mexico (GM, CAR), Panama, Venezuela (Caballer-Gutiérrez et al., 2015; Valdés et al., 2006). Material: ARC05, 1 specimen, 15 mm (CMPY-000407); ARE01, 2 specimens, 12-16 mm (CMPY-000613; CMPY-000615); AREExt03, 1 specimen, 30 mm (CMPY-000616). Distribution: Belize, Cuba, Mexico (GM, CAR), Panama, USA (Ortigosa et al., 2015; Valdés et al., 2006). Material: ARC01, 1 specimen, 11 mm (CMPY-000710). Distribution: Amphiatlantic. Western Atlantic: Brazil, Mexico (GM), Puerto Rico, USA, Venezuela (Almada et al., 2016; Caballer-Gutiérrez et al., 2015; Valdés et al., 2006). Distribution: Antigua, Aruba, Cayman Islands, Colombia, Costa Rica, Grenada, Guadeloupe, Honduras, Martinique, Mexico (new record: GM), Panama, Puerto Rico, St. Lucia, St. Martin, St. Vincent and the Grenadines, Trinidad and Tobago, USA, Venezuela, Virgin Islands (Caballer-Gutiérrez et al., 2015; Goodheart et al., 2016; Valdés et al., 2006). Material: ARC03, 1 specimen, 10 mm (CMPY-000408); ARC04, 1 specimen, 15 mm (CMPY-000402); AREExt02, 2 specimens, 12-32 mm (CMPY-000665; CMPY-000629); ARE32, 1 specimen, 10 mm (CMPY-000622); ARENoc, 1 specimen, 20 mm (CMPY-000681). Distribution: Antigua, Bahamas, Barbados, Belize, Bonaire, Brazil, Cayman Islands, Colombia, Costa Rica, Cuba, Dominican Republic, Grenada, Guadeloupe, Honduras, Jamaica, Martinique, Mexico (GM, CAR), Panama, St. Christopher, St. Kitts, St. Lucia, St. Martin, St. Vincent and the Grenadines, USA, Venezuela, Virgin Islands (Caballer-Gutiérrez et al., 2015; Goodheart et al., 2016; Valdés et al., 2006). Material: ARE03, 1 specimen, 8 mm (CMPY-000625). Distribution: Barbados, Belize, Cayman Islands, Guadeloupe, Honduras, Mexico (GM), Panama, USA, Virgin Islands (Goodheart et al., 2016; Sanvicente-Añorve et al., 2012; Valdés et al., 2006). Material: ARCExt16, 7 specimens, 15-40 mm (CMPY-000385). Distribution: cosmopolitan in temperate warm waters. Western Atlantic: Aruba, Bahamas, Bermuda, Bonaire, Brazil, Costa Rica, Curaçao, Mexico (GM), USA, Venezuela (Caballer-Gutiérrez et al., 2015; Valdés et al., 2006). Cuthona sp. (as Cuthona sp. B in Redfern, 2013; probably as Cuthona sp. in Edmunds & Just, 1983). Material: ARC05, 2 specimens, 3 mm (CMPY-000403). Distribution: Bahamas, Barbados, Mexico (new record: GM) (Edmunds & Just, 1983; Redfern, 2013). Material: ARE31, 1 specimen, 9 mm (CMPY-000624). Distribution: Mexico (GM), USA (Carmona et al., 2014; Ortigosa et al., 2013; Valdés et al., 2006). Material: AREExt03, 1 specimen, 10 mm (CMPY-000643). Distribution: Amphiatlantic. Western Atlantic: Bahamas, Belize, Costa Rica, Curaçao, Honduras, Mexico (new record: GM; CAR), St. Vincent and the Grenadines (Carmona et al., 2013; Valdés et al., 2006). Material: 12 specimens found at both reefs. All the specimens observed were empty shells (CMPY-003199, CMPY-003200). Distribution: Antigua, Bahamas, Barbados, Barbuda, Belize, Bermuda, Brazil, Colombia, Costa Rica, Cuba, Dominicana, Grenada, Guadeloupe, Honduras, Jamaica, Martinique, Mexico (GM, CAR), Panama, St. Lucia, St. Martin, St. Vincent and the Grenadines, Surinam, Trinidad and Tobago, USA, Uruguay, Venezuela, Virgin Islands (Caballer-Gutiérrez et al., 2015; Malaquias & Reid, 2008). Material: ARE01, 1 specimen, 0.5 mm (CMPY-000626); ARE06, 2 specimens, 10, 14 mm (CMPY-000619; CMPY-000646). Figure 2. Species from Cayo Arcas and Cayo Arenas. A. Sclerodoris worki (Ev. Marcus and Er. Marcus, 1967), B. Platydoris angustipes (Mörch, 1863), C. Polycera odhneri Er. Marcus, 1955, D. Felimare nyalya (Ev. Marcus and Er. Marcus, 1967), E. Felimare ruthae (Ev. Marcus and Hughes, 1974), F. Felimare bayeri Ev. Marcus and Er. Marcus, 1967, G. Felimare picta (Schultz in Philippi, 1836), H. Hexabranchus morsomus Ev. Marcus and Er. Marcus, 1962, I. Dendrodoris krebsii (Mörch, 1863), J. Tritonia bayeri Ev. Marcus and Er. Marcus, 1967, K. Scyllaea pelagica Linnaeus, 1758, L. Cuthona sp. Distribution: Aruba, Bahamas, Bonaire, Cayman Islands, Cuba, Curaçao, Guadeloupe, Jamaica, Mexico (GM, CAR), Puerto Rico, USA, Venezuela (Caballer-Gutiérrez et al., 2015). Material: AREExt03, 1 shell, 12 mm (CMPY-000546). Distribution: Mexico (present study: GM). Material: AREExt02, 1 specimen, 1 mm (CMPY-000623); ARE09, 1 specimen, 0.8 mm (CMPY-000645); ARE28, 1 specimen, 0.5 mm (CMPY-000637). Distribution: Circumtropical. Western Atlantic: Anguilla, Aruba, Bahamas, Bermuda, Bonaire, Brazil, Cayman Islands, Costa Rica, Cuba, Curaçao, Guadeloupe, Jamaica, Mexico (GM, CAR), Puerto Rico, St. Vincent and the Grenadines, USA, Venezuela, Virgin Islands (Caballer-Gutiérrez et al., 2015; de la Cruz-Francisco et al., 2017; Valdés et al., 2006). Material: AREExt02, 1 specimen, 40 mm (CMPY-000648). Distribution: Amphiatlantic. Western Atlantic: Anguilla, Aruba, Bahamas, Barbados, Belize, Bermuda, Bonaire, Brazil, Cayman Islands, Colombia, Costa Rica, Cuba, Curaçao, Guadeloupe, Jamaica, Martinique, Mexico (GM, CAR), Panama, Puerto Rico, St. Christopher, St. Kitts, St. Martin, USA, Venezuela, Virgin Islands (Caballer-Gutiérrez et al., 2015). Material: AREExt17, 1 specimen, 95 mm (CMPY-000675). Distribution: Western Atlantic: Jamaica, Mexico (GM), USA, Venezuela (Valdés et al., 2017). Material: ARC0A: 2 specimens, 12 mm (CMPY-000533). Distribution: Circumtropical. Western Atlantic: Bahamas, Belize, Colombia, Costa Rica, Cuba, Guadeloupe, Honduras, Jamaica, Martinique, Mexico (new record: GM, CAR), Puerto Rico, USA, Venezuela (Caballer-Gutiérrez et al., 2015; Valdés et al., 2006). Material: AREExt02, 2 specimens, 30 mm (CMPY-000678; CMPY-000654). Material: ARE03, 2 specimens, 20, 23 mm (CMPY-000632; CMPY-000635); ARE06, 1 specimen, 25 mm (CMPY-000641); AREExt02, 3 specimens, 20-30 mm (CMPY-000652; CMPY-000661; CMPY-000659). Distribution: Circumtropical. Western Atlantic: Aruba, Bahamas, Barbados, Bermuda, Bonaire, Brazil, Cayman Islands, Colombia, Costa Rica, Cuba, Curaçao, Guadeloupe, Jamaica, Mexico (GM), Puerto Rico, USA, Venezuela (Caballer-Gutiérrez et al., 2015; Valdés et al., 2006). Material: ARC04, 1 specimen, 10 mm (CMPY-000387); ARE28, 10 specimens, 10-25 mm (CMPY-000617; CMPY-000683; CMPY-000614). Distribution: Bahamas, Barbados, Belize, Bermuda, Brazil, Cayman Islands, Colombia, Costa Rica, Cuba, Guadeloupe, Haiti, Honduras, Jamaica, Mexico (GM, CAR), Panama, St. Martin, St. Vincent and the Grenadines, Trinidad and Tobago, USA, Venezuela, Virgin Islands (Caballer-Gutiérrez et al., 2015; de la Cruz Francisco et al., 2017; Krug et al., 2016; Valdés et al., 2006). Material: ARE09, 1 specimen, 7 mm (CMPY-000639). Distribution: Amphiatlantic. Western Atlantic: Belize, Bermuda, Brazil, Costa Rica, Cuba, Curaçao, Guadeloupe, Jamaica, Mexico (GM), Panama, Puerto Rico, Venezuela (Caballer-Gutiérrez et al., 2015; Krug et al., 2016; Ortigosa et al., 2015). Material: AREExt02, 3 specimens, 2-4 mm. Distribution: Bahamas, Cayman Islands, Jamaica, Mexico (GM), USA (Krug et al., 2016). Material: ARE09, 4 specimens, 10-13 mm (CMPY-000647; CMPY-000644; CMPY-000634). Figure 3. Species from Cayo Arcas and Cayo Arenas. A. Berghia stephanieae (Valdés, 2005), B. Bulla occidentalis A. Adams, 1850, C. Chelidonura hirundinina (Quoy and Gaimard, 1833), D. Haminoea sp., E. Aplysia dactylomela Rang, 1828, F. Stylocheilus striatus (Quoy and Gaimard, 1832), G. Dolabrifera ascifera (Rang, 1828), H. Petalifera ramosa Baba, 1959, I. Petalifera sp., J. Elysia crispata Mörch, 1863, K. Elysia flava Verrill, 1901, L. Elysia sp., M. Thuridilla picta (A. E. Verrill, 1901). Material: ARE28, 1 specimen, 10 mm (CMPY-000628). Distribution: Amphiatlantic. Western Atlantic: Bahamas, Bermuda, Costa Rica, Curaçao, Jamaica, Mexico (GM), USA (Camacho et al., 2014; de la Cruz Francisco et al., 2017; Valdés et al., 2006). Material: AREExt03, 1 specimen, 5 mm (CMPY-000711). Distribution: Brazil, Costa Rica, Mexico (new record: GM), Trinidad and Tobago and USA (Valdés et al., 2006). Present results describe the heterobranch fauna from 2 remote coral reefs: Cayo Arcas and Cayo Arenas in the Campeche Bank, for the first time. The accumulated species richness is comprised by 30 species, 10 of which represent new species records for the region. These Campeche Bank Reefs turned out to be an unexplored area, such as other marine areas in the Caribbean with a potential to increase our knowledge of heterobranchs species distribution (Camacho et al., 2014). For example, the finding of Hexabranchus morsomus at Cayo Arenas represents an important geographical range extension within its Atlantic distribution being the first record within the Gulf of Mexico. Six other species are also new records for the Gulf of Mexico (Sclerodoris worki, Platydoris angustipes, Polycera odhneri, Hexabranchus morsomus, Limenandra nodosa, Petalifera ramosa, and Hermaea cruciata). Nine specimens could not be identified to species, since they did not match any of the species previously recorded for the Atlantic coast of Mexico, and represent potential new species, or considerable phenotypic variation within described species for the region. The 2 specimens attributed to Cuthona resemble in size, shape and color the specimen figured in Redfern (2013) as Cuthona sp. B. He also proposed that his 2 specimens named as Cuthona sp. B were the same species of Edmunds and Just (1983) from Barbados, who avoided describing it as a new species because they had only a single animal. On the other hand, from the 41 valid species of the genus Haminoea Turton and Kingston, 1830 distributed in temperate and tropical waters (MolluscaBase, 2018), only 4 have been recorded within the Gulf of Mexico (Rosenberg et al., 2009). The shape, color and proportions of the shell within the genus are very similar among the different species, which complicates the identification (Malaquias & Cervera, 2005). The shell found at Cayo Arenas lacks the spiral grooves that cover the body whorl of Haminoea elegans (Gray, 1825), and although it is as smooth as Haminoea antillarum (d’Orbigny, 1841), Haminoea glabra (A. Adams, 1850), and Haminoea succinea (Conrad, 1846), is considerably less globose than any of those 3 species and therefore it was conservatively considered as Haminoea sp. The genus Petalifera has 6 described species but only 2 had been registered in the Caribbean: P. petalifera and P. ramosa (Valdés et al., 2006). The specimens found at Cayo Arenas agrees with Petalifera, but it lacks the opaque white pigment of P. petalifera and the conical pink tubercles with the terminal papilla of P. ramosa (Valdés et al., 2006). Its shape, color and size also resemble Phyllaplysia lafonti (Fischer, 1870) from the Mediterranean Sea, Atlantic coast of Europe and Indo-West Pacific in having concentric bands of light and dark pigmentation. Nevertheless, Pruvot-Fol (1954) states that this species lacks a shell and the collected specimens did present a shell. Redfern (2013) states that the specimen figured by Valdés et al. (2006) as P. petalifera from Martinique is, indeed, a specimen of P. lafonti. The remaining specimens were identified as Elysia sp. This genus has been recently studied by Krug et al. (2016), who identified specific morphological characters from the now described 90 species. However, the same authors also claimed that the species description is not complete since over 40 candidate species have not yet been matched to existing descriptions. The specimens found at Cayo Arenas resemble the specimen figured by Valdés et al. (2006) as Elysia scops Ev. Marcus & Er. Marcus, 1967 originally described from Florida. Nevertheless, the status of this species could not be analyzed by Krug et al. (2016), as the photographed specimen disappeared. Furthermore, the presence of small white papillae and the dark band on the parapodial margin, the presence of more than 2 dorsal vessels and light blue speckles at the dorsum, partially match Elysia papillosa Verril, 1901 and Elysia taino Krug, Vendetti and Valdés, 2016 although its reliable identification, according to Krug et al. (2016), can only be determined through molecular analysis. Recently, Valdés et al. (2017) studied the molecular and morphological systematics of the genus Dolabrifera. According to their results, there are 2 species within the Caribbean region: Dolabrifera virens Verrill, 1901 and Dolabrifera ascifera (Rang, 1828). Elysia crispata is a common species at both reefs, as well as other areas of the Gulf of Mexico such as Veracruz (Zamora-Silva & Ortigosa, 2012) and Alacranes reef (Ortigosa et al., 2015; Sanvicente-Añorve, 2012). Nevertheless, it is important to notice that in reefs close to the continental shelf such as Madagascar, Serpiente and Sisal, it has not yet been detected (Ortigosa et al., 2013). Cayo Arcas is adjacent to Mexico’s most important offshore oil and gas production zone, and despite that sector slowdown during the last 10 years, it is still prone to an oil-spill disaster as well as vulnerable to the intense industry-related, national and international shipping transit with the potential for invasive species introduction and coral reef ship groundings. If we add the risk of extreme weather events that both reefs are exposed to, it becomes clear how important it is to describe these reefs species richness and diversity to foster the understanding of the processes that maintain such diversity. So far, the relative remoteness of these reefs has helped their conservation but has also delayed their study. Thanks to Q. Hernández for the organization and logistics of both expeditions, D. Ugalde and T. García for administrative help; Q. Hernández-Díaz, A. Pérez-Botello, S. Valdés, and M. Álvarez for collecting some specimens. P. Krug, X. G. Vital-Arriaga, J. L. Cervera, and L. Carmona for enriching comments. Cayo Arcas expedition: thanks to the crew of the Buque de Investigación Oceanográfico “Río Hondo” (BI-06), Secretaría de Marina; I. Cruz Queb and L. A. Carrasco Guerrero, lighthouse-keepers from the Secretaría de Comunicaciones y Transportes. Cayo Arenas expedition: thanks to Cabo CG Contramaestre C. de J. Astegla Silva and R. Estrada Ramos. First author had a postdoctoral grant from DGAPA-UNAM 2017-2018. Both expeditions were financed by grants to NS by the Harte Institute and Conabio (NE018). This is a BDMY publication. Almada, F., Levy, A., & Robalo, J. I. (2016). Not so sluggish: the success of the Felimare picta complex (Gastropoda, Nudibranchia) crossing Atlantic biogeographic barriers. PeerJ, 4, e1561. Alvin, J., & Dias-Pimenta, A. (2016). Comparative morphoplogy and redescription of Pleurobranchus species (Gastropoda, Pleurobranchoidea) from Brazil. Zoological Studies, 55, 15. Bouchet, P., Rocroi, J. P., Hausdorf, B., Kaim, A., Kano, Y., Nützel, A. et al. (2017). Revised classification, nomenclator and typification of gastropod and monoplacophoran families. Malacologia, 61, 1–526. Caballer-Gutiérrez, M. C., Ortea, J., Rivero, N., Tucker, G. C., Malaquias, M. A. E., & Narciso, S. (2015). The opisthobranch gastropods (Mollusca: Heterobranchia) from Venezuela: an annotated and illustrated inventory of species. Zootaxa, 4034, 201–256. Camacho-García, Y., Pola, M., Carmona, L., Padula, V., Villani, G., & Cervera, J. L. (2014). 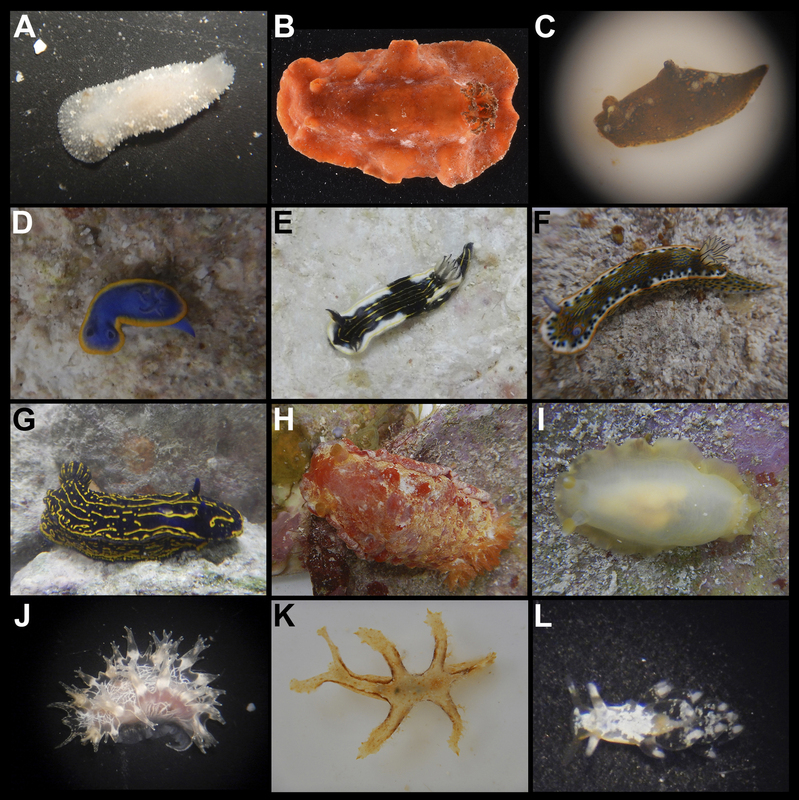 Diversity and distribution of the heterobranch sea slug fauna on the Caribbean of Costa Rica. Cahiers de Biologie Marine, 55, 109–127. Carmona, L., Pola, M., Gosliner, T. M., & Cervera, J. L. (2013). The end of a long controversy: systematics of the genus Limenandra (Mollusca: Nudibranchia: Aeolidiidae). Helgoland Marine Research, 68, 37–48. Carmona, L., Pola, M., Gosliner, T. M., & Cervera, J. L. (2014). The Atlantic-Mediterranean genus Berghia Trinchese, 1877 (Nudibranchia: Aeolidiidae): taxonomic review and phylogenetic analysis. Journal of Molluscan Studies, 80, 482–498. de la Cruz-Francisco, V., Ortigosa, D., & González-González, M. (2017). Primeros registros de babosas marinas (Gastropoda: Heterobranchia) del Sistema Arrecifal Tuxpan, México, con ampliaciones de ámbito de distribución. Biodiversity Natural History, 3, 15–23. Duarte, J., Hermoso-Salazar, M., Anker, A., & Simões, N. (2014). Eight new records of alpheid shrimps (Decapoda: Caridea: Alpheidae) in the Southern Coast of Gulf of México. Marine Biodiversity Records, e1101. Edmunds, M., & Just, H. (1983). Eolid nudibranchiate mollusca from Barbados. Journal of Molluscan Studies, 49, 185–203. Escobar-Briones, E., & Jiménez-Guadarrama, E. L. (2010). Macrocrustáceos (Peracarida, Decapoda) de fondos carbonatados del sector occidental del banco de Campeche en el sur del golfo de México. Revista Mexicana de Biodiversidad, 81 (Suplem. ), S63–S72. García-Cubas, A., Escobar, F., & Reguero, M. (1999). Gastrópodos marinos de la Península de Yucatán, México. Revista de la Sociedad Mexicana de Historia Natural, 49, 127–146. González, M. A., Chávez, E., de la Cruz, G., & Torruco, D. (1991). Patrones de distribución de gasterópodos y bivalvos en la Península de Yucatán, México. Ciencias Marinas, 17, 147–172. González-Muñoz, R., Simões, N., Tello-Musi, J. L., & Rodríguez, E. (2013). Sea anemones (Cnidaria, Anthozoa, Actiniaria) from coral reefs in the southern Gulf of Mexico. Zookeys, 341, 77–106. Goodheart, J. A., Ellingson, R. A., Vital, X. G., Galvão-Filho, H. C., McCarthy, J. B., Medrano S. M. et al. (2016). 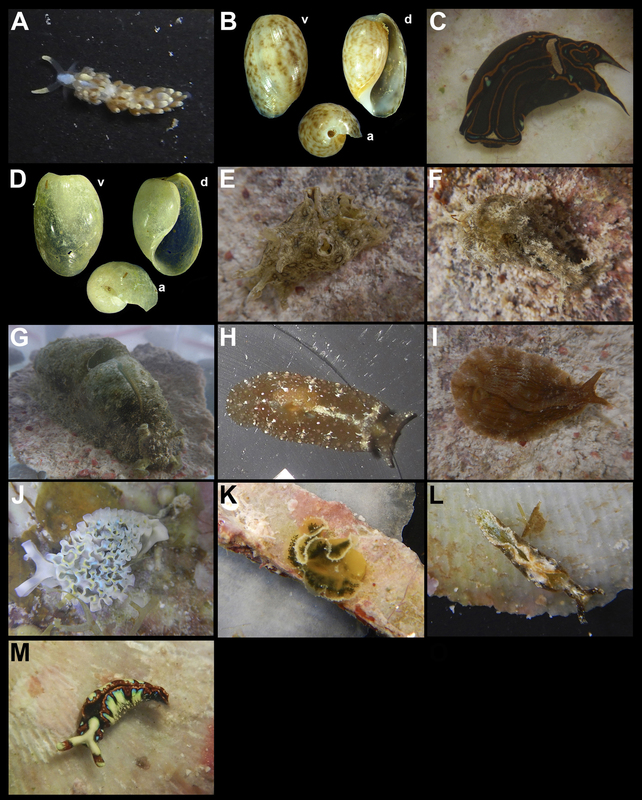 Identification guide to the heterobranch sea slugs (Mollusca: Gastropoda) from Bocas del Toro, Panama. Marine Biodiversity Records, 9, 56. Hernández-Díaz, Y. Q., Solís-Marín, F. A., & Simões, N. (2013). First record of Ophioderma ensiferum (Echinodermata: Ophiuroidea) in the southeastern continental shelf of the Gulf of Mexico and in an anchialine cave. Revista Mexicana de Biodiversidad, 84, 676–681. Hicks, D. W., Barrera, N. C., & Tunell, W. Jr. (2001). Ecological distribution of shallow-water Mollusca on the Alacran reef, Campeche Bank, Yucatan, Mexico. Texas Concholology, 38, 7–30. Kornicker, S., Bonet, F., Ross, C., & Charles, H. (1959). Alacran Reef, Campeche Bank, Mexico. Publications of the Institute of Marine Science, University of Texas, 6, 1–22. Krug, P. J., Vendetti, J. E., & Valdés, Á. (2016). Molecular and morphological systematics of Elysia Risso, 1818 (Heterobranchia: Sacoglossa) from the Caribbean region. Zootaxa, 4148, 1–137. Malaquias, M. A. E., & Cervera, J. L. (2005). The genus Haminoea (Gastropoda: Cephalaspidea) in Portugal, with a review of the European species. Journal of Molluscan Studies, 72, 89–103. Malaquias, M. A. E., & Reid, D. G. (2008). Systematic revision of the living species of Bullidae (Mollusca: Gastropoda: Cephalaspidea), with a molecular phylogenetic analysis. Zoological Journal of the Linnean Society, 153, 453–543. Mendoza-Becerril, M. A., Simões, N., & Genzano, G. (2018). Benthic hydroids (Cnidaria, Hydrozoa) from Alacranes Reef, Gulf of Mexico, Mexico. Bulletin of Marine Science, 94, 125–142. Moreno-Mendoza, R., González-Salas, C., Aguilar-Perera, A., Gallardo-Torres, A., & Simões, N. (2011). First record of the white-eye goby, Bollmannia boqueronensis Evermann and Marsh 1899 (Teleostei: Perciformes: Gobiidae) for Mexico. Marine Biodiversity Records, 4, 1–4. Ortigosa, D., Lemus-Santana, E., & Simões, N. (2015). New records of the opisthobranchs (Mollusca: Gastropoda) from the National Park Arrecife Alacranes, Yucatán, Mexico. Marine Biodiversity Records, e117. Ortigosa, D., Simões, N., & Calado, G. (2013). Seaslugs (Mollusca: Opisthobranchia) from Campeche Bank, Yucatán, Mexico. Thalassas, 29, 59–75. Ortigosa, D., Suárez-Mozo, N. Y., Barrera, N. C., & Simões, N. (2018). First survey of Interstitial molluscs from Cayo Nuevo, Campeche Bank, Gulf of Mexico. Zookeys, 779, 1–17. Paz-Ríos, C. E., & Ardisson, P. L. (2013). Benthic amphipods (Amphipoda: Gammaridea and Corophiidea) from the Mexican southeast sector of the Gulf of Mexico: checklist, new records and zoogeographic comments. Zootaxa, 3635, 137–173. Paz-Ríos, C. E., Simões, N., & Ardisson, P. L. (2013a). Records and observations on amphipods (Amphipoda: Gammaridea and Corophiidea) from macrofouling communities in Alacranes Reef, Gulf of Mexico. Marine Biodiversity Records, 16, 1–16. Paz-Ríos, C. E., Simões, N., & Ardisson, P. L. (2013b). Intertidal and shallow water amphipods (Amphipoda: Gammaridea and Corophiidea) from Isla Pérez, Alacranes Reef, southern Gulf of Mexico. Nauplius, 21, 179–194. Paz-Ríos, C. E., Simões, N., & Pech, D. (2018a). A dataset on the species composition of amphipods (Crustacea) in a Mexican marine national park: Alacranes Reef, Yucatán. Biodiversity Data Journal, 6, e22622. Pruvot-Fol, A. (1954). Mollusques opisthobranches, 58. Paris: Lechevalier. Redfern, C. (2013). Bahamian seashells: 1161 species from Abaco, Bahamas. Bahamas: Bahamianseashells. com, Inc.
Reyes-Gómez, A., Ortigosa, D., & Simões, N. (2017). Chitons (Mollusca, Polyplacophora) from Alacranes Reef, Yucatán, Mexico. Zookeys, 665, 1–36. Rice, W. H., & Kornicker, S. (1962). Mollusks of Alacran Reef, Campeche Bank, México. Publications of the Institute of Marine Science, 8, 366–403. Robertson, D. R., Pérez-España, H., Núñez-Lara, E., Puc-Itza, F., & Simões, N. (2016). The fishes of Cayo Arcas (Campeche Bank, Gulf of Mexico): an updated checklist. Zookeys, 640, 139–155. Rosenberg, G., Moretzsohn, F., & García, E. F. (2009). Gastropoda (Mollusca) of the Gulf of Mexico. Gulf of Mexico-origins, waters and biota. Biodiversity. College Station: Texas A&M Press. Santana-Moreno, D., DeGrave, S., & Simões, N. (2013). New records of caridean shrimps (decapoda, caridea) from shallow waters along the North Yucatán peninsula coasts of Mexico. Nauplius, 21, 225–238. Sanvicente-Añorve, L., Solis-Weiss, V., Ortigosa, J., Hermoso-Salazar, M., & Lemus-Santana, E. (2012). Opisthobranch fauna from the National Park Arrecife Alacranes, southern Gulf of Mexico. Cahiers de Biologie Marine, 53, 447–460. Solís-Marín, F. A., Pineda-Enríquez, T., Hernández-Díaz, Y. Q., Yepes-Gaurisas, D., González-Gándara, C., de la Cruz, F. et al. (2015). First records and range extension of Ophioblenna antillensis Lütken, 1859 (Echinodermata: Ophiuroidea) in the Gulf of Mexico. Revista Mexicana de Biodiversidad, 86, 306–309. Tunnell, Jr. J.W., Chávez, E. A. C., & Withers, K. (2010). Arrecifes coralinos del sur del golfo de México. Baja California Sur: Centro Interdisciplinario de Ciencias Marinas, Instituto Politécnico Nacional. Ugalde, D., Gómez, P., & Simões, N. (2015). Marine sponges (Porifera: Demospongiae) from the Gulf of México, new records and redescription of Erylus trisphaerus (de Laubenfels, 1953). Zootaxa, 3911, 151–183. Valdés, Á., Hamann, J., & Behrens, D. W. (2006). Caribbean sea slugs: a field guide to the Opisthobranch mollusks from the Tropical Nortwestern Atlantic. Hong Kong: Sea Challengers Natural History Books. Valdés, Á., Breslau, E., Padula, V., Schrödl, M., Camacho, Y., Malaquias, M. A. E. et al. (2017). Molecular and morphological systematics of Dolabrifera Gray, 1847 (Mollusca: Gastropoda: Heterobranchia: Aplysiomorpha). Zoological Journal of the Linnean Society, 184, 31–65. Vokes, H. E., & Vokes, E. H. (1983). Distribution of shallow-water marine mollusca, Yucatán Peninsula, Mexico. New Orleans: Mesoamerican Ecology Institute/ Middle American Research Institute/ Tulane University. Zamora-Silva, A., & Ortigosa, D. (2012). Nuevos registros de opistobranquios en el Parque Nacional Sistema Arrecifal Veracruzano, México. Revista Mexicana de Biodiversidad, 83, 359–369. Zarco-Perelló, S., Moreno-Mendoza, R., & Simões, N. (2014). Checklist of fishes from Madagascar Reef, Campeche Bank, Mexico. Biodiverisy Data Journal, 2, e1100.